This event is targeted at SINGLES between the age of 25 to 38 year old. Do you need a short holiday getaway to recharge? Then this trip is perfect for you! Join us on a trip to Bintan island and bask in the warmth of the sun, sand and sea! Get to meet and mingle with other travel lovers! If you are looking at learning golf or you have always been wanting to try out archery, there will be an introductory session included. You can also expect fun activities by the beach and poolside. A hell lot of fun guaranteed! Free & easy: Myriad of island activities you can participate at your own expenses. 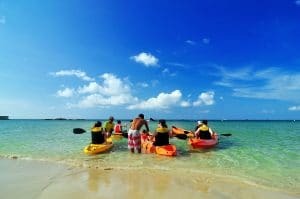 Activities include spa & massage, jetskis, snorkelling, surfing, ATV & many more! Lucky Draw: Win a return trip back to Bintan Resorts! *Price is after $100 deduction of SDN credits, assuming full credits utilised. ^Usual price applies if participant do not qualify/have SDN credits. How to sign up as a SDN member to get $100 off? Step 4: Once approved, $100# will be credited into your SDN account. Step 5: Inform Fabrique that you are utilising your SDN credits for this trip. #Bi-annually during Spark Connections, SDN members can receive $100 worth of free credits which can be used to offset up to 50% of the featured events. For the upcoming run of Spark Connections, the $100 credits will be available from mid- Aug 2017. For any payment matters, please write to us at events@fabriquelove.com. – We are expecting a total of 30 participants with a minimum of 60-40 gender balance. Can I still join if I fall out of the age group category? – This event is most suitable for singles who are age 25 to 38. Do keep a lookout for other events that cater to your age group. What is the meeting time and what if I miss the ferry? – Meeting time is 8.00am at Tanah Merah Ferry Terminal. If you miss the ferry, you can take the next ferry in to Bintan. Additional charges will apply and it will be at participant’s own expenses. – Yes, you can. Additional charges will apply. Please contact Fabrique Event Coordinator for trip extensions. Can I share the same twin sharing cabin with my friend / sibling of the opposite gender? – No, roommates must be of the same gender. If I sign up on this trip alone, can I opt for twin sharing with other participants? – No. Unfortunately, you will have to opt for single room occupancy. – A full itinerary will be sent to you a week before we depart. – All activities and meals will be at your own expenses unless otherwise stated in the package. Do they allow SGD or USD in Bintan? 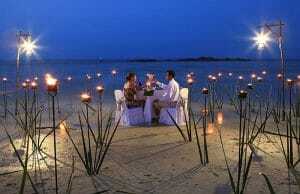 – Bintan only accepts Rupiah currency. Please ensure to exchange spare cash before your trip. Remember to activate your credit card as well. This event is co-hosted with Bintan Resorts and in collaboration with Bintan Lagoon Resort. This event is supported by Spark Connection.